Show Recap – Hospitality Staffing / Diamond Discounts / and Mortgage Talk Including 1st Time Buyer Info and Doctor Loan Programs! 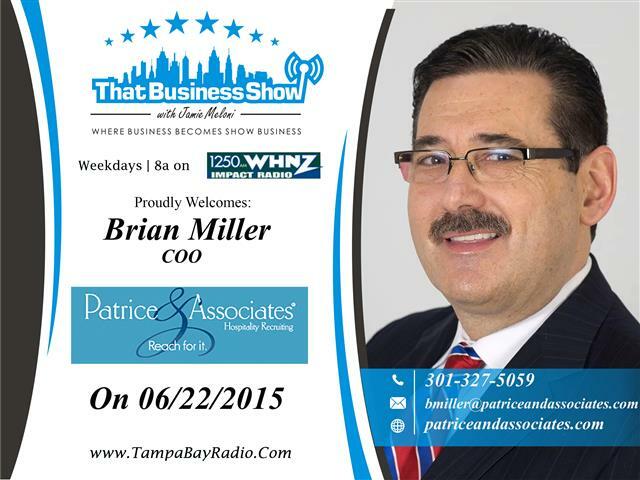 Brian Miller kicked off week 21 on #ThatBusinessShow this morning on #1250WHNZ. Brian is the Chief Operating Officer of Patrice and Associates, a National recruiting firm assisting employers and employees looking for work in the hospitality and restaurant industries. With the growing demand for managerial talent in the restaurant industry especially in the Tampa region, Patrice and Associates has a vast network of professionals in all areas of skill to help staff your company. Learn more at http://www.patriceandassociates.com and reach out to Brian Miller directly at bmiller@patriceandassociates.com for more information on how they can help you with your hospitality business! 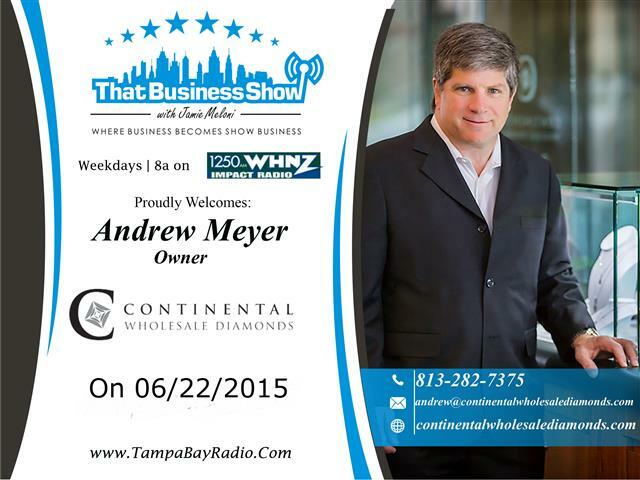 On the 2nd segment, I spoke with Andrew Meyer, Owner of Continental Wholesale Diamonds. Andrew and his company are wholesalers and can offer you a much better price on diamonds and jewelry than the textbook retail outlets that we see advertised on television everyday. Andrew has been in the diamond industry his entire life and is well versed in the area of diamond valuation and designs and loves helping loved ones find that special diamond ring for whatever the occasion. Continental Wholesale Diamonds is also holding an open house on Wednesday June 24th from 5:30 to 7:30 and they are located at 1715 N WestShore Blvd Suite 150 in Tampa. Mention That Business Show and the first 5 people to the event will receive $100 off a $200 and up purchase at the store. Visit http://www.continentalwholesalediamonds.com for more information and email Andrew at Andrew@continentalwholesalediamonds.com for more information! 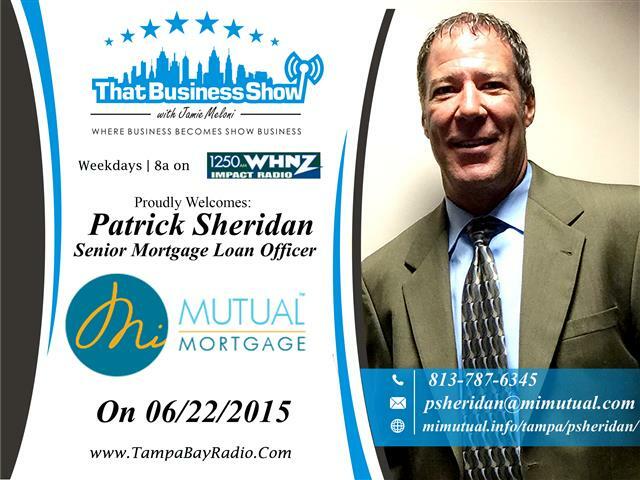 On the 2nd half of the show, I welcomed Patrick Sheridan, Senior Mortgage Loan Officer with MI Mutual Mortgage to the show. With over 17 years of experience in the lending industry, Patrick is well versed in the field and eager to help you with your home purchase. Patrick and MI Mutual have programs available for Doctors looking to purchase and many programs available for first time buyers. Patrick and I discussed the current lending environment and touched on the benefits and need to know information for many loan programs including VA loans for the Veterans. Learn more about Patrick at http://www.mimutual.info/tampa/psheridan and he can be reached at 813-787-6345 or email at psheridan@mimutual.com for more information!